Bald eagle (Haliaeetus Leucocephalus) is a North American raptor. 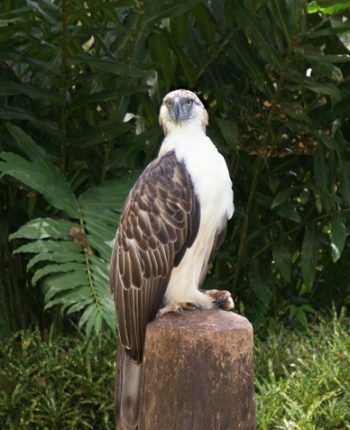 Its scientific name is a combination of Greek words that literally means “Sea-eagle White-head”. It is a very close cousin of white-tailed eagle. Alaska is home to some of the largest bald eagles. The head and tail are white and the rest of the plumage is dark brown. Male eagles are 25 percent smaller than the females. There are no feathers on its legs. It has a curved bright yellow-colored beak. It can grow up to a length range of 70 to 102 centimeters and weighs around 6.6 to 14 pounds. Its wingspan is 7.5 feet in length. The size of its tree nest is the largest for any animal and measures 8.2 feet across and 13 feet in depth. In the wild, it has an average lifespan of 20 years. It reaches m aturity at the age of 5 years. Like most eagles, bald eagles do not change partners unless one of them dies. It lays eggs in late February and they are hatched in March to early May. Each egg averages 7.3 centimeters in length and 5.4 centimeters wide. A female bald eagle spawns 1 to 3 eggs in a year and looks after them for about 2 to 3 weeks. The growth rate of an eaglet (young eagle) is the fastest in North America. An eaglet is able to fledge between 8 and 14 weeks. It is widely distributed across North America, Canada and North Mexico. It inhabits a wide variety of habitats including mangrove swamps, pasturelands, slash and longleaf pines, lakes and seacoasts. It usually occupies those water bodies that have plenty of fish. Bald eagles roost on conifers and deciduous trees. They build large nests on trees that are more than 75 feet in height. The size of the largest nest measures 10 feet in width and 20 feet in depth. Bald eagle is a carnivore and opportunistic feeder. The primary diet of this eagle, however, consists of fish including Pacific herring, humpback salmon, silver salmon, red salmon, sand lance, European carp, American shad, trout and eels. Besides, it also eats aquatic birds like herons, geese and coots. Among mammals, it preys on North American raccoons, beavers, rabbits, muskrats and young deer (fawns). In reptiles, it actively feeds on turtles. In crustaceans, it prefers to eat crabs and crayfish. During gliding, bald eagle can fly as fast as 40 mph. However, the diving speed is from 75 to 99 mph. 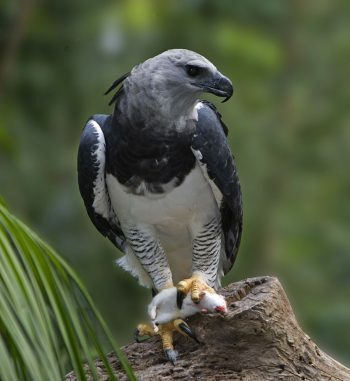 The eggs and eaglets are eaten by predators like owls, bobcats, North American raccoons, hawks, gulls, ravens, American black bears and eagles.